IRS Form EIB-SBA941-SS, "Employer's Quarterly Federal Tax Return" is a tax form issued by the United States Internal Revenue Service. 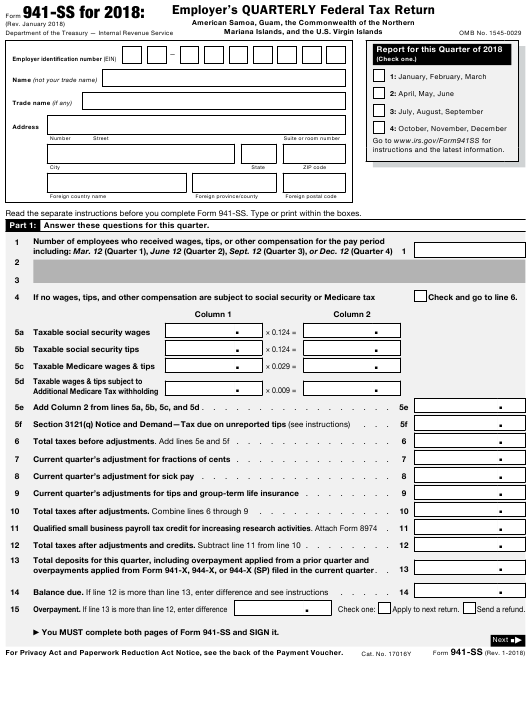 The latest version of the form was released in January 1, 2018. A up-to-date fillable EIB-SBA941-SS Form in PDF is available for download below. The IRS-issued "Employer's Quarterly Federal Tax Return" is available for digital filing or can be filled out through the Adobe Reader application on your desktop or mobile device. instructions and the latest information. Read the separate instructions before you complete Form 941-SS. Type or print within the boxes. Answer these questions for this quarter. Check and go to line 6. Add Column 2 from lines 5a, 5b, 5c, and 5d . Total taxes before adjustments. Add lines 5e and 5f . Current quarter’s adjustment for fractions of cents . Current quarter’s adjustment for sick pay . Current quarter’s adjustments for tips and group-term life insurance . Total taxes after adjustments and credits. Subtract line 11 from line 10 .
overpayments applied from Form 941-X, 944-X, or 944-X (SP) filed in the current quarter . You MUST complete both pages of Form 941-SS and SIGN it. For Privacy Act and Paperwork Reduction Act Notice, see the back of the Payment Voucher. Tell us about your deposit schedule and tax liability for this quarter. If you are unsure about whether you are a monthly schedule depositor or a semiweekly schedule depositor, see section 8 of Pub. 80.
semiweekly schedule depositor, attach Schedule B (Form 941). Go to Part 3.
total liability for the quarter, then go to Part 3. Total must equal line 12. Report of Tax Liability for Semiweekly Schedule Depositors, and attach it to Form 941-SS. Tell us about your business. If a question does NOT apply to your business, leave it blank. If your business has closed or you stopped paying wages . If you are a seasonal employer and you don’t have to file a return for every quarter of the year . May we speak with your third-party designee? Sign here. You MUST complete both pages of Form 941-SS and SIGN it. Check if you are self-employed . applied in this entry space. address as shown on Form 941-SS. of your payment may be $2,500 or more. 2018”) on your check or money order. Don’t send cash. transfer. See section 8 of Pub. 80 for deposit instructions. Don’t use Form 941-V(SS) to make federal tax deposits. 941-SS (or to each other). penalty. See Deposit Penalties in section 8 of Pub. 80.
above Part 1 on Form 941-SS. Detach Here and Mail With Your Payment and Form 941-SS. Don’t staple this voucher or your payment to Form 941-SS. 4 Enter your business name (individual name if sole proprietor). Enter your city, state, and ZIP code or your city, foreign country name, foreign province/county, and foreign postal code. and possessions for use in administering their tax laws. need it to figure and collect the right amount of tax. Recordkeeping . . . . . . . . . . 10 hr., 31 min. fraudulent information, you may be subject to penalties. Learning about the law or the form . . . .
sending the form to the IRS . . . . . . . .
941-SS simpler, we would be happy to hear from you. File? in the Instructions for Form 941-SS.